Believe me when it comes to save space in today’s era of low space homes, people think of many different things. Similar was the thinking of people at INV/ALT design, Denver, Colorado, USA. We found not only the magnetic cups, but other types of useful items as well. The designs were all unique and wonderful. Look at the pictures below and you’ll appreciate the efforts. INV/ALT design is a product design and former ceramic production studio based in Denver, Colorado, USA. Angela Schwab specializes in INVention of new forms through ALTeration of existing objects in order to enhance the way people can use and interact with everyday functional products. Neodymium magnets are attached to the underside of Crate&Barrel ceramics and embedded in the surface of a pub table from Target. 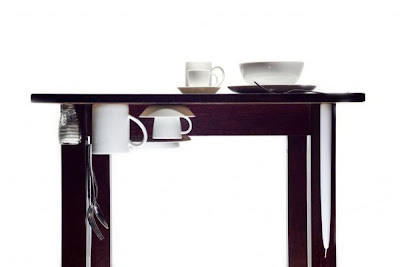 Magnets hold ware underneath the table for storage; magnets embedded in the tabletop pull ceramics into proper place settings for symmetrical dining. 10 ounce ceramic cups with a magnet embedded in each side. 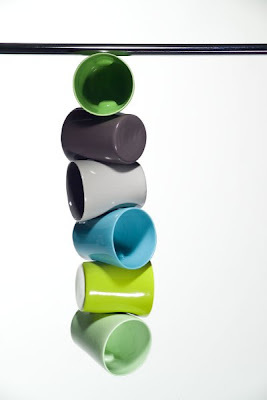 Indents help cups hug and twist as they are pulled together like links in a chain.